Collagen is the most abundant protein in your body, making up about one quarter of all of your protein based tissues. According to the Protein Data Bank website, collagen forms the matrix for your bones, strengthens your tendons and gives resilience and support to the skin and internal organs. When collagen is depleted or not being formed properly, you start to see skin sagging and wrinkles, spongy gums and loose teeth as in scurvy, and even dry, brittle bones. Vitamin C is absolutely necessary for collagen formation in your body, and according to the Protein Dat Bank website, the symptoms of vitamin C deficiency, also called scurvy, happen because without vitamin C, new collagen can't grow to repair the damage caused by everyday activities. Vitamin C deficiency shows up as spongy gums with loose teeth and easy bruising. 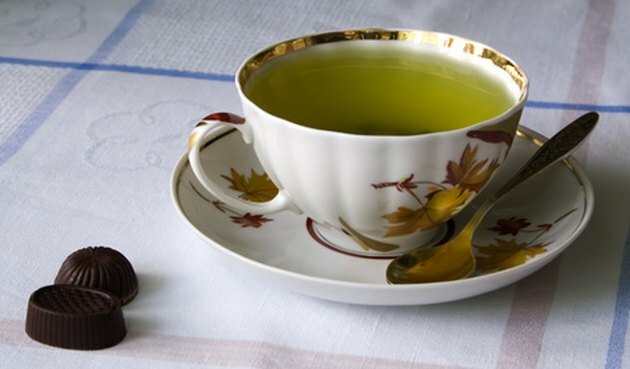 Catechins are the anti-oxidant and anti-inflammatory components of green tea. They have also been found to stimulate healthy maturing of collagen fibers and proper collagen fiber orientation in wound healing. A study in the "American Journal of Pathology" showed that green tea catechins can help your body to build collagen more effectively. Collagen is made out of hydroxylysine and hydroxyproline, which are in turn made out of the amino acids lysine and proline. "The Journal of Cardiovascular Pharmacology" reported that the maximum collagen enhancing benefits were found when lysine, proline, vitamin C and green tea catechins were all used together. American Journal of Pathology: Effects of epicatechin gallate on wound healing and scar formation in a full thickness incisional wound healing model in rats. Journal of Cardiovascular Pharmacology: Extracellular matrix-mediated control of aortic smooth muscle cell growth and migration by a combination of ascorbic acid, lysine, proline, and catechins.